Hearing stories and advice from other heart families has been invaluable to us as a family during our own heart journey. Our heart children are inspiring and amazing but the journey can be very tough at times and being able to share our own thoughts and reflections and know that there are others out there on similar journeys can be very helpful. 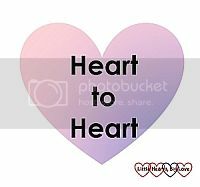 Heart to heart is my monthly linky for other heart families to share a blog post about an aspect of their heart journey. It can be an update on how their heart child is progressing, it can be sharing advice for other heart families, a reflection or even poetry, an old post or a new one – just as long as it is about an aspect of life as a heart family. It will open on the 15th of each month and stay open for a week to give you plenty of time to share your stories. I also have a Pinterest board for sharing CHD related posts and you can see previous Heart to Heart posts here.